Good quality, flavoursome ingredients are always better cooked simply. What’s the point in drowning the delicate, unmistakable flavour of asparagus in a rich sauce or heavy dressing? Instead, enjoy such wonderful produce cooked in butter, or as the main event on top of an Asparagus and Mozzarella Pizza. There are two types of asparagus in the world. The stuff you get year round, which is barely worth your money, and the locally produced hand-cut stems of marvel that come about in around April every year. These two products are worlds apart, with the latter worthy of any recipe and the former barely worthy of note. You’ll need to be prepared for a little expense, but occasionally you’ll find a lovely bunch of British asparagus for a really tempting price. Give in. Please. Actually, that’s an order. I always keep spare balls of dough in my freezer, just in case there is need of a quick supper. This recipe is divine, but with the right ingredients and a little preparation it takes a matter of minutes to throw together. It’s point 4 of my frugal tips all over. Preheat your oven to 220C/200C(fan). Roll out your balls of dough into two thin circles, roughly 8 inches in diameter. 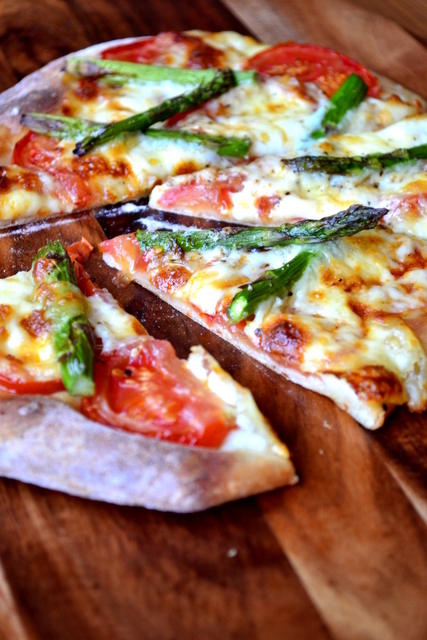 Layer each base with a sliced tomato, roughly ripped mozzarella and the halved asparagus stems. Sprinkle with a little salt and pepper. Cost: As long as you make it at home the cost of pizza dough is more or less negligible. Perhaps 10-20p for two balls of the stuff. 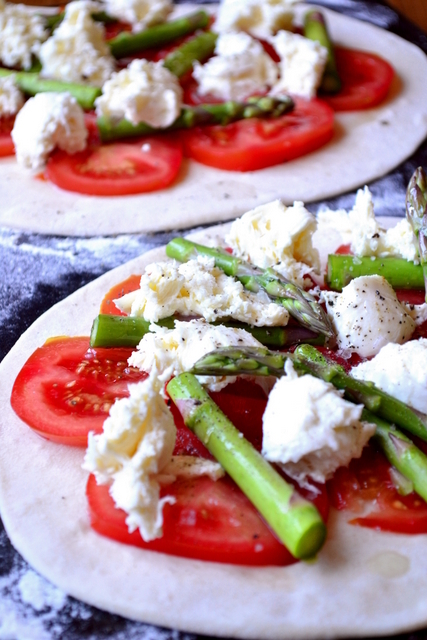 Asparagus is a little more pricey, but this recipe for asparagus and mozzarella pizza will set you back little more than £3.20! oooh, what a great way to eat asparagus! I bought my first local (Worcestershire) asparagus of the season yesterday. I boiled it and ate it dripping in butter but an asparagus pizza will definitely make an appearance some time soon. Thanks for the inspiration. Fantastic! I recommend frying it rather than boiling it – or at least steaming it. This looks so good! I’m really craving a slice of pizza now! 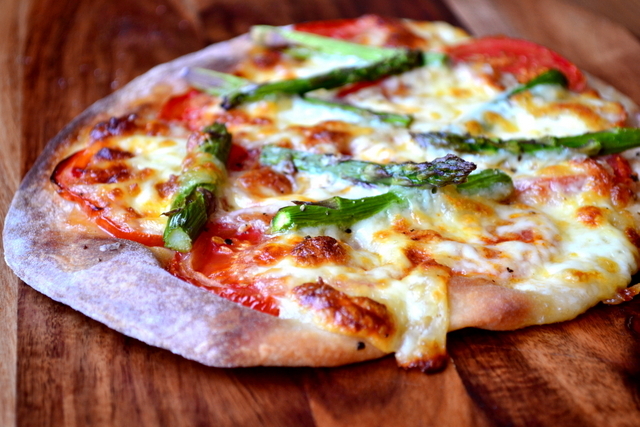 Roasting asparagus really enhances its flavor…what a great idea to use it on pizza. It looks terrific. Thank you – yes it did have a really great flavour. Easy, perfect and delicious! We grow our own asparagus (a tiny bed which produces a few spears a year) but this would be a perfect way to eat it! It would indeed! I can’t wait to have space to grow some. There you g, I’ve added a link to the recipe – it’s Jamie Oliver’s. 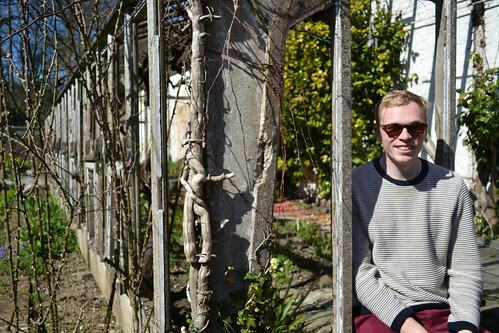 I have nominated you and your blog for the Liebster Award. Congratulations on your wonderful blog! If you do choose to accept you can find all the information on my blog, Gabi. That sounds so good. And I can’t believe I’ve never thought of keeping pizza dough in the freezer! It keeps perfectly – just defrost the evening before use in the fridge. I make pizza all the time and couldn’t agree with you more about it being quick and delicious. 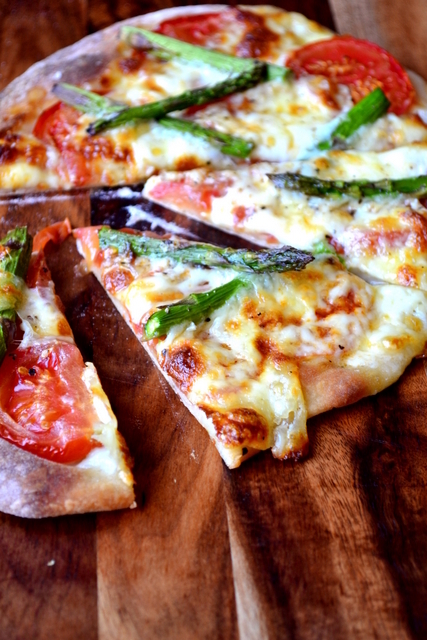 This asparagus pizza looks truly amazing and will be next on my list of toppings to try. Thank you – yes, pizza dough is always a handy thing to have on stock.